Kimberly Gottula, a second-year industrial engineering student, submitted So You’ve Been Publicly Shamed in a campus-wide call for the 2018-19 Common Read selection. Cal Poly Pomona has its newest pick for the CPP Common Read. 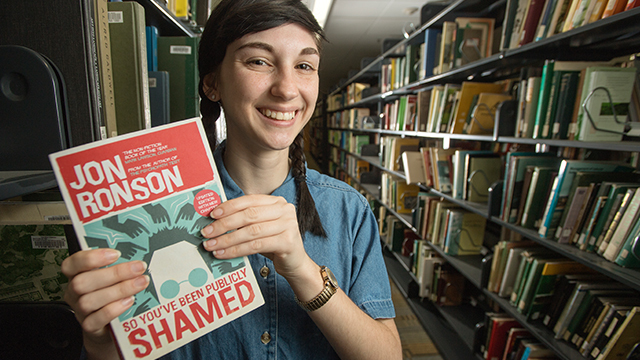 Students in FYE courses in 2018-19 will read Jon Ronson’s So You’ve Been Publicly Shamed, a nonfiction book that delves into the phenomenon of public humiliation on the internet. First-year freshmen and transfer students are encouraged to read the book to fully participate in the FYE experience, but all students, faculty, staff and community members can read the book and attend FYE programming. The Office of Student Success and the First Year Experience Committee, which spearheads the initiative, chose the book because they felt students would relate to current issues around life on the internet, and that it would foster dialogue about authenticity on social media. So You’ve Been Publicly Shamed was one of five finalists for this year’s book. Dora Lee, who oversees FYE as the director of Academic Support & Learning Services, said that the CPP Common Read is a way for students to have a shared experience and foster friendship. Many first-year students who read last year’s choice, The Distance Between Us by Reyna Grande, told their faculty how much they related to the book and enjoyed talking about it. Kimberly Gottula, a second-year industrial engineering student, submitted Ronson’s book in a campus-wide call for recommendations. She read the book in high school and liked that Ronson explained concepts in a relatable way. Established in 2007, FYE is a growing community within the Cal Poly Pomona campus. In FYE courses across many of the colleges, both first-time freshmen and transfer students learn more about student life and opportunities for their major. To learn more about the FYE program and the Common Read, visit its website. Zoe is the communications specialist for the Office of Student Success and a Cal Poly Pomona alumna (English, ’15). She oversees student communication for the Office of Student Success and Semester Conversion.